Halloween is around the corner, and I can’t wait for all the candy costumes and pumpkins. We’re going to be attending a wicked bash this weekend, and I’ll be sharing our hilarious couples costume on SM, so stay tuned…. We’ve been crazy busy these past several weekends with an unexpected project that hijacked a bunch of our time. Our old gas fireplace in our downstairs rec room cacked and had to be replaced. Probably a smart move since it sometimes smelled like gas from time to time. Anyhoo, you’re in store for some BIG project pics and overview of a room I’ve never before shown on the blog, and there will be tons of pics featuring how we’ve brought the project together. We’re still working away at it any free weekend we have, so please be patient. It’s SO going to be worth it. Think stacked stone, barn board and ship lap. Moving on to the topic at hand: Halloween decorating doesn’t have to be complicated or expensive. I simply love using items from around my house (and backyard) to create new and fun decor. I figured that this little black raven was the perfect piece inside an empty frame, along with a stick from my backyard that I painted black. The raven is both creepy and cool. The nesting spiders are the Radest. Things. Ever. and were found at a thrift store. My absolute favourite poem of all time is The Raven by Edgar Allan Poe. It’s powerful, dark and very mysterious, so it’s no surprise that it’s been embraced as a Halloween mantra. 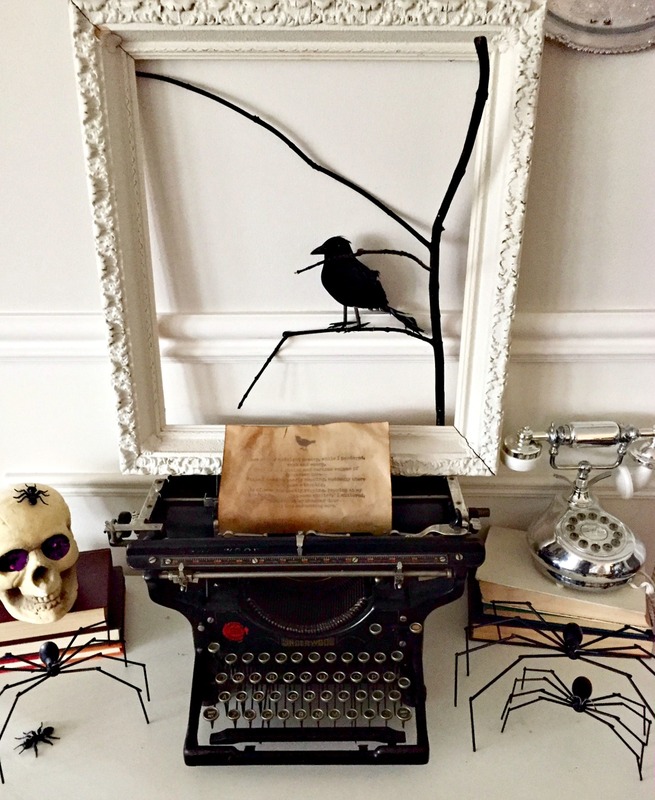 For this little Halloween vignette, I printed out the famous poem and then “aged” the paper using my tried and true method (soak the paper in shallow hot water with tea bags and instant coffee crystals). Once the paper dried, I placed it in my vintage Underwood typewriter to make it look like the poem had just been typed and then sat there for nearly 200 years. 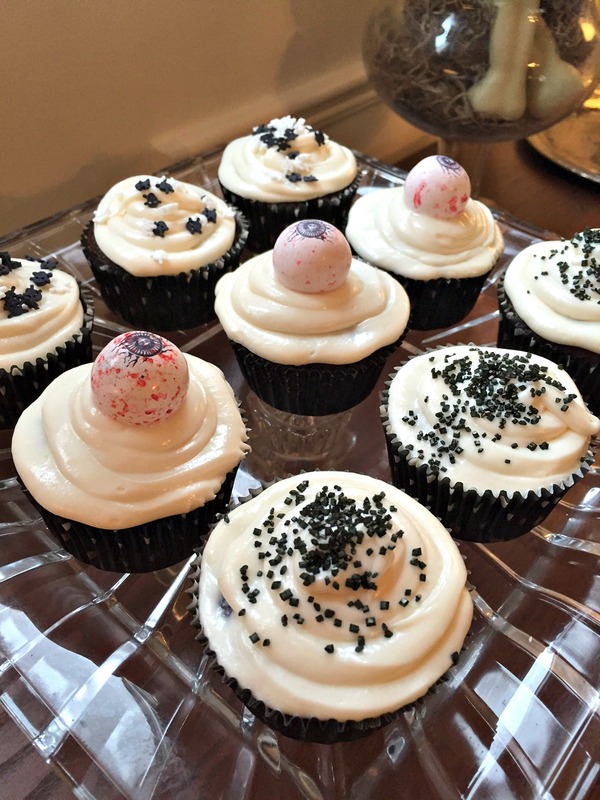 Another great way to create a Halloween vibe in your home is to bake! Making cute cupcakes is also a quick and easy (and cheap) way of showing your guests some love. I picked up these awesome eyeball gumballs, skull & crossbones, and black sprinkles at my local bulk foods store. 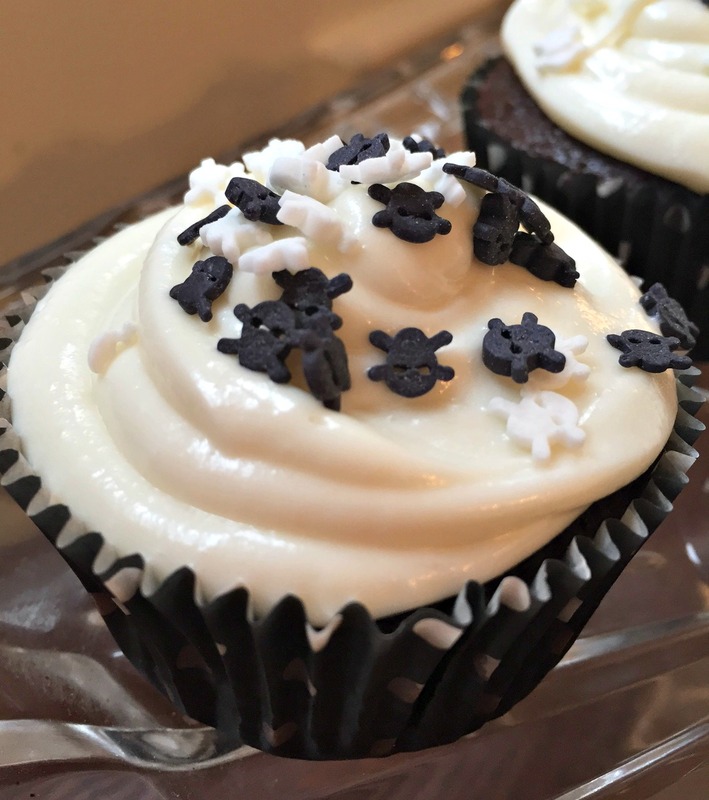 I keep it pretty simple with any baking that I do, and I just use the box cake mixes and pre-made icing. I like to focus my time on the decorating to make them special. Ewww. 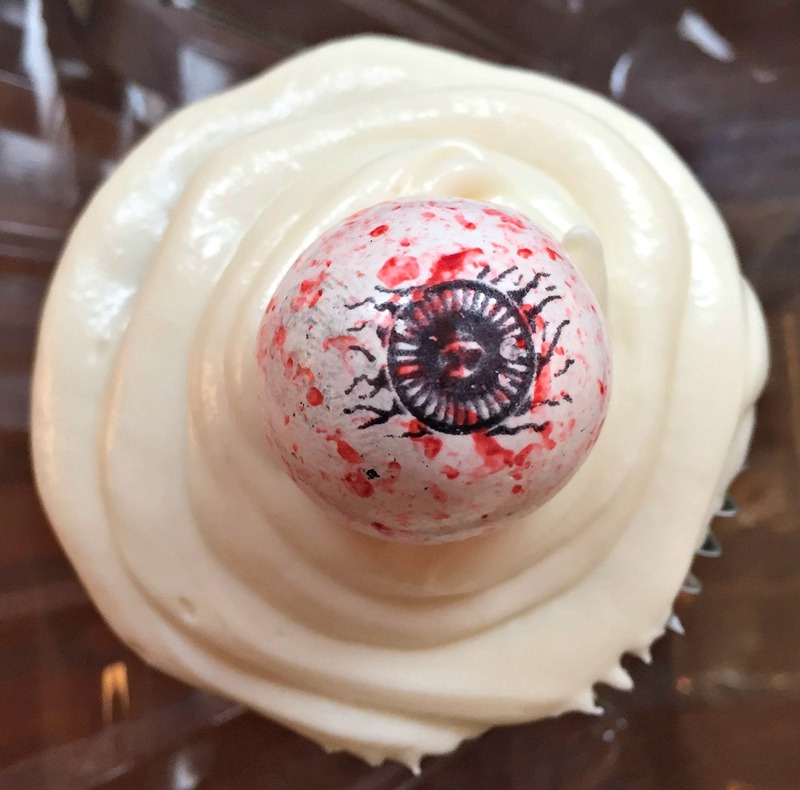 Creepy eyeball! Those gross veins make me want to hurl…. I love me a good tablescape! No holiday (I know Halloween isn’t really a holiday… but it should be!) is complete without a special table setting. I created this fun tablescape as part of Jenn’s 31 Days of Halloween Extravaganza. 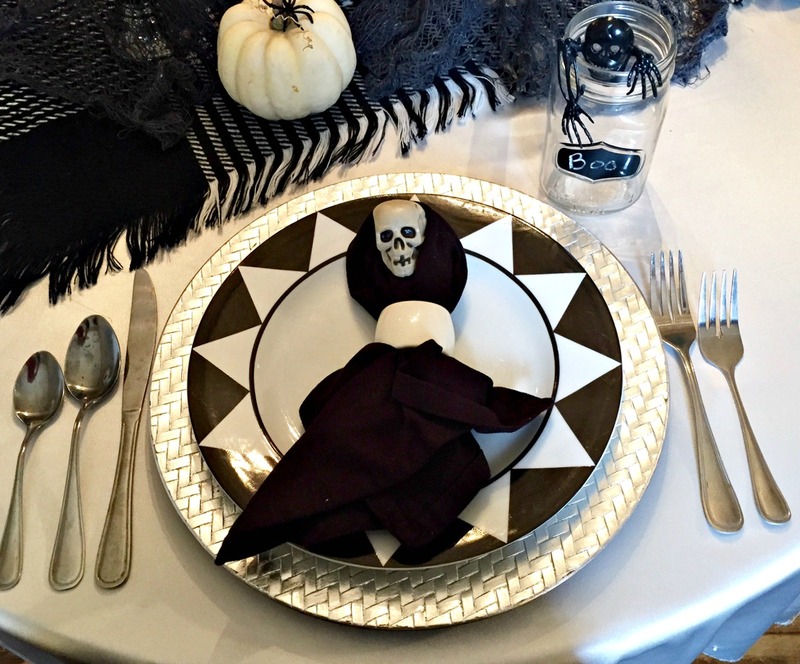 Click on over to see the full Halloween Tablescape along with some fun recipes and other Halloween decor ideas.